A battery is a device for converting chemical energy into electrical energy. Batteries can consist of a single voltaic cell or a series of voltaic cells joined to each other. (In a voltaic cell, electrical energy is produced as the result of a chemical reaction between two different metals immersed in a solution, usually a liquid.) Batteries can be found everywhere in the world around us, from the giant batteries that provide electrical energy in spacecraft to the miniature batteries that power radios and penlights. The correct use of the term battery is reserved for groups of two or more voltaic cells. The lead storage battery found in automobiles, for example, contains six voltaic cells. However, in common usage, a single cell is often referred to as a battery. For example, the common dry cell battery found in flashlights is really a single voltaic cell. 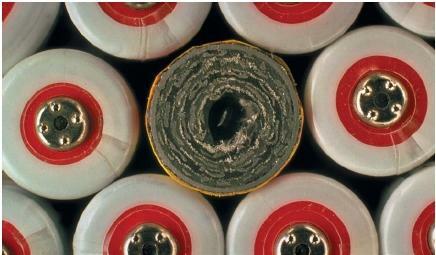 Batteries can be classified as primary or secondary batteries (or cells). A primary battery is one designed to be used just once. When the battery has run down (produced all the energy it can), it is discarded. Secondary batteries, on the other hand, can be recharged and reused. The best known example of a primary battery is probably the common dry cell invented by French engineer Georges Leclanché (1839–1882). The dry cell consists of a zinc container that supplies electrons to the battery; a carbon rod through which the electrons flow; and a moist paste of zinc chloride and ammonium chloride, which accepts the electrons produced from the zinc. Technically, the zinc container is the anode (the electrode at which electrons are given up to a reaction) and the moist paste is the cathode (the electrode at which electrons are taken up from a reaction) in the cell. The Leclanché cell is called a dry cell because no liquid is present in it. However, it is not really dry because of the presence of the moist paste, which is needed if electrons are to flow through the cell. The dry cell runs down as the zinc can is slowly used up. At some point there is not enough zinc left to produce electrons at a useable rate. At that point, the dry cell is just thrown away. Secondary cells. 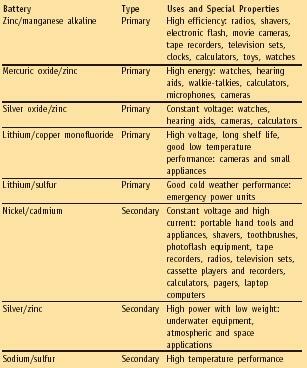 The secondary cell with which you are likely to be familiar is the lead storage battery found in automobiles. The lead storage battery usually consists of six voltaic cells connected to each other. The total amount of energy produced by the battery is equal to the sum of the electrical energy from the six cells. Since each cell produces about two volts, the total energy available from the cell is 12 volts. As the lead storage battery is used, it runs down. That is, the lead plates in the battery are converted to lead sulfate. Unlike the dry cell, however, this process can be reversed. Electrical current can be passed back into the battery, and lead sulfate is changed back into lead. If you could see the lead plates in a battery, you would see them slowly disappearing when the battery is being used and slowly reappearing when the battery is being recharged. Recharging occurs naturally when the automobile is operating and generating its own electricity or when a source of external current is provided in order to recharge the battery.